Twilight Sparkle, Rainbow Dash and Applejack are back in 2013 Enterplay My Little Pony Friendship is Magic Series 2. The follow-up to the smash first series once again mixes basic trading cards with foil inserts, tattoos, stickers and more. The 2013 Enterplay My Little Pony Friendship is Magic Series 2 base set returns to the land of Equestria, catching up with the magical ponies that live there and their friends. Every pack comes with a total of four base cards. Complimenting the set are several simple and fun inserts. Foil Cards fall 1:2 packs. Some of the most popular cards in Series 1, foils offer a shimmering look. Pop-Up Standees and Stickers are each inserted 1:4 packs. Pop-Ups can be folded so that they stand on a desk, table or a hip dad's dashboard. FunTat Tattoo Cards come one per pack, let collectors young and old decorate themselves with cutie marks. Every pack also has a Sweepstakes Card offering some My Little Pony-themed prizes. 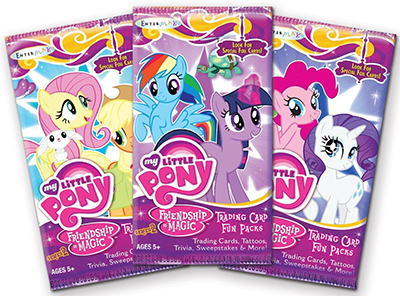 Finally, every 2013 Enterplay My Little Pony Friendship is Magic Series 2 box comes with a special box topper. There are four different box toppers to collect. 67 Behold the Crystal Princess! 79 I Just Can’t Decide! 81 A Bad, Bad Seed! 10 cards. Not available in packs. S9 Have Tuba. Will Travel.